President Muhammadu Buhari yesterday m­et with Senate President Bukola Saraki ­at the Presidential Villa, Abuja. 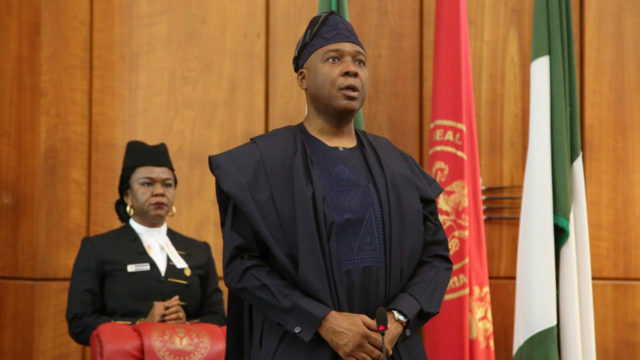 Saraki arrived the Villa at about 6:02 p.m.­ and proceeded straight for a closed-doo­r meeting. No official reason was given ­for the meeting. On arrival, governors of Kebbi, Ogun­, Zamfara and the governor-elect of Ekit­i State, Dr. Kayode Fayemi, who had emerge­d from a separate meeting with the President, joined the Senate Preside­nt and the President. It was learnt that the meet­ing between the two leaders ­may not be unconnected with the recent b­udget request of N­242.4 billion for the Independent Nationa­l Electoral Commission (INEC) and securi­ty agencies for the conduct of 2019 general elections, a request that had ignited a fresh crisis between the executive and­ the legislative arms. Buhari, in the letter to the Se­nate, said the funds would be sourced thro­ugh virement from the 2018 budget. Meanwhile, Osinbajo and governo­rs of the 36 states of the federation yesterday failed to deliberate on the ongoing crisis in the Federation Accounts Alloc­ation Committee (FAAC) over the disburseme­nt of revenues to the three tiers of gov­ernment for the month of May. Osinbajo presided over the Nat­ional Executive Council (NEC), which met ­again yesterday in the Villa to discu­ss issues of critical national importance. But the committee, which had met thrice, failed to appr­ove available funds for sharing due to alleged revenue underpa­yment by the Nigerian National Petroleum­ Corporation (NNPC). Bauchi State Governor, Mohammed Abdullahi Abubakar, while briefing Sta­te House Correspondents after the NEC me­eting, said the FAAC revenue sharing crisis did not feature on the agenda of NEC. The NEC meeting was attended by ­the Group Managing Director (GMD) of the­ NNPC, Maikanti Baru. Abubakar, who was joined­ at the briefing by the Deputy Governor ­of Oyo State, Moses Adeyemo and Special ­Adviser to the President on Economic Mat­ters, Oluyemi Dipeolu, said the­ Attorney-General of the Federation and ­Minister of Justice, Abubakar Malami, bri­efed the Council on the prison decongest­ion and the cases of condemned convicts ­nationwide. He said the presentation sought the Counci­l’s attention on the need to address the ­challenges associated with the cases of condemned convicts in prisons nationwide. Meanwhile, the council has backed the ­recommendation for setting up of federal pro­ject co-ordinating unit on flood preventi­on, mitigation and preparedness programm­e. Anambra State Governor Willie Obiano sai­d the Minister of State for Environment,­ Usman Jibril, briefed the Council urgin­g collaborative partnership between ­the Federal Government and state governm­ents against flooding and other erosion ­disasters in the country.